Canon Speedlite 540EZ Shoe Mount Flash for Canon w/case. Condition is Used. Shipped with USPS Priority Mail. 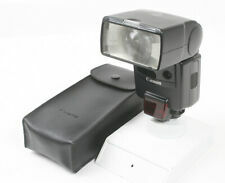 Canon Speedlite model 540EZ flash for EOS SLR film series Comes with manual and case. Condition is Used. Shipped with USPS Priority Mail. Has broken corner on battery cover. Used item. Tested and appear to work good. Well loved and used Canon Speedlite 540EX. Could use a good cleaning. Tested and works great. This is a used Canon Speedlite 540EZ in near Mint and working condition. Batteries aren’t included. What you see in the pictures it’s exactly what you’ll get. What you see is what you get! Utilizing manual zooming, it’s light output may be employed as an overall illumination source or as a spot, background or hair light. It incorporates sophisticated features that permit everything from simple, automated flash shooting to advanced, flash-enhanced photographic techniques. Glass: None. in very used Conditions. it is in Very Used Conditions, and in working Order. You are purchasing EXACTLY what you see in the pictures! This Canon Speedlite 540EZ is in excellent condition with little or no marks and includes a leather case. CANON SPEEDLITE 540EZ, WITH CASE, WORKING, LOOKS EX. You are buying from a professional photographic dealer. You should expect everything to function reasonably well, and that all optics have no problems that would noticeably affect image quality, unless we describe them otherwise. The Poverello Center, Inc. provides nutritious food, services and basic living essentials with the highest degree of understanding, respect and love for individuals living with critical and chronic illnesses, including HIV, in South Florida. The functionality and excellent performance of the Canon Speedlite 540EZ flash is also prized for its portability as well. Skin tones are more lifelike and pleasing, which is a big plus for such a small flash unit. 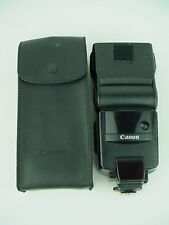 Canon SPEEDLITE 540EZ Shoe Mount Flash w/ Case from Japan [Exc ] #11003A. Appearance of the item. However, I will provide courteous and responsive service. I will look it for you. Including Case. There is usually abrasion by the use. Canon Speedlite 540EZ Flash for Canon. Fully working and in excellent condition with light normal signs of use. Includes soft case. 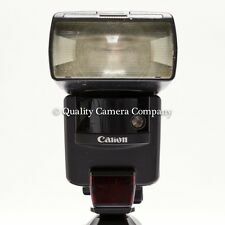 Canon 540EZ Speedlite TTL Shoe Mount Flash for EOS. TTL Dedication Yes (A-TTL ). Our flash is in great condition! Flash has been tested and will power up and work properly. Great exterior condition. ACanon Speedlite 540EZ #OI1003. This is a powerful flash dedicated for Canon EOS. Made in Japan. This is a genuine Canon speedlite 540EZ hot shoe part new and sealed up for sale. Part # Y17-2069 Shipping and handling $5.00 Thank you for looking!!! Here is a Canon 540EZ Speedlite flash unit with bounce, swivel, and a built-in diffuser that pulls up and folds down in front of the flash area. This is the extent of my testing. I do not do much flash photography and am not an expert on this. Canon Speedlite 540EZ Shoe Mount Flash for Canon. Flash only no ACCESSORIES. Cones with flash and case. Condition is For parts or not working. Poor appearance. Appearance is beautiful, tiny scuffs from normal use. ■Appearance■. I send a product by EMS. Pre-owned, Like new. Above condition is based on my own opinion. Pre-owned, heavy signs of use. Appearance of the item. Excellent Condition. I will look it for you. I will provide courteous and responsive service. Canon Speedlite 540EZ TTL Flash for Canon EOS from Japan " Tested Working"
Canon Speedlite 540EZ Flash for Canon EOS from Japan. ◆Functional. Flash works really well. This item is sold out everywhere in Japan and very hard to get it! ◆Appearance of the item. Lens is clear. Canon Speedlite 540EZ Shoe Mount Flash. From Japan. Appearance of the item. All you can see in the photos are included.